Justin Trudeau would win another majority mandate if an election were held today. These results are from Mainstreet Research’s new UltraPoll, a conglomeration of ten provincial polls where federal voting intentions were also asked. The poll surveyed 9830 Canadians between January 3rd and January 6th. The poll has a margin of error of +/- 0.99% and is accurate 19 times out of 20. 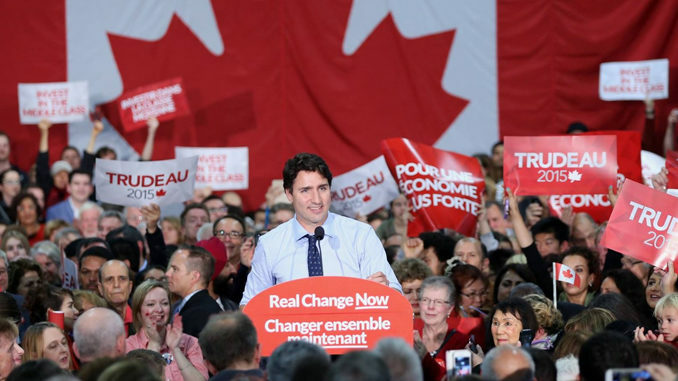 “The Liberals stand almost in the exact same position that they finished with on election day in 2015, with just over 1 in 4 Canadians ready to give Justin Trudeau their vote”, said Quito Maggi, President and CEO of Mainstreet Research. “Andrew Scheer and the Conservatives stand six points back at 34.5%, and the NDP under Jagmeet Singh has the support of just over 13% of Canadian voters”. The Green Party under Elizabeth May has the support of over 6% of Canadians and the Bloc Quebecois round out the field with just under 4% and 16% in Quebec. Maggi notes the great generational divide in support between the Trudeau Liberals and the Scheer Conservatives. “The Conservatives do best among those over 65 years of age where they enjoy the support of over four in ten voters and are tied with the Liberals. Among those under 35, now the largest voting bloc in Canada, their support drops to just 27% and they trail the Liberals by almost 16 points”, Maggi said. The Mainstreet poll also finds that the NDP’s fortunes have not changed now that they have Jagmeet Singh as their leader. “The NDP under Singh continue to struggle much as they did under former leader Tom Mulcair,” added Maggi. “Their support is highest among those under 35, in BC and Quebec, although they sit in 4th place in both Quebec and BC. They also trail the Green Party and May in Atlantic Canada where they fail to reach double-digit support”. The Liberals remain strong in the regions that gave them their majority win in 2015, which points to likely re-election of the Prime Minister. The Liberals enjoy a 24% lead in Quebec, a 19% lead in Atlantic Canada, and 7% lead in Ontario and British Columbia. “While the Liberals are in a very strong position as 2018 begins, next year’s federal election is still seventeen months away, and there are sure to be many events that will impact voter intentions in that time”, Maggi concluded. Wouldn’t “1 in 4” be 25%?